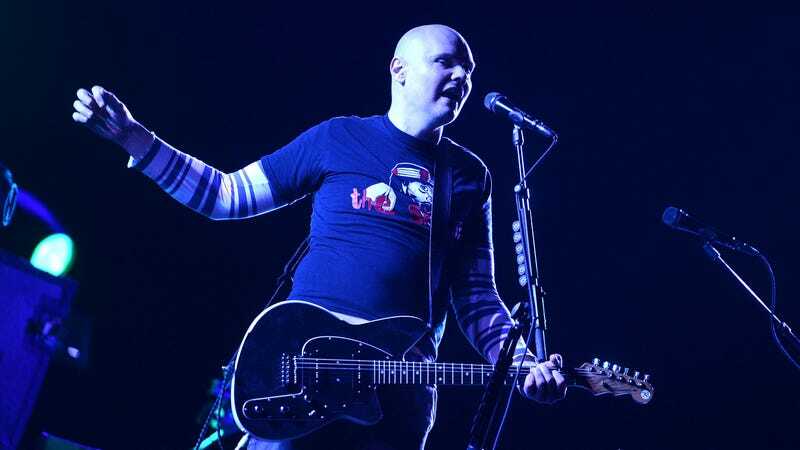 Recently, Billy Corgan has been teasing some new Smashing Pumpkins music, noting in a lengthy Instagram post that he’s working with Rick Rubin on some kind of reunion, and now a leaked image from a photoshoot has apparently revealed that not every original member of the band is up for the revival. This comes from Alternative Nation, which notes that the photo features original Pumpkins members Corgan, James Iha, and Jimmy Chamberlin, as well as newer guitarist Jeff Schroeder. That leaves out founding bassist D’arcy Wretzky, with Alternative Nation indicating that Schroeder has been playing bass in the studio and may take her place during live shows as well. Supposedly, Wretzky was originally “supposed” to be involved in the reunion, but something evidently fell though. You can see one of the leaked photos below, though it may shatter your perceptions of just how real these cool band photoshoots are.